Much like most of Season 2, this episode was just "Ok". Nothing special, tbh. 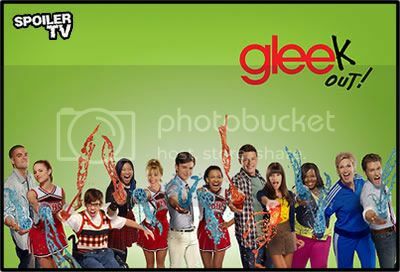 I liked the amount of songs for this episode, but seriously, more Rachel-Finn-Quinn love triangle crap? Also there was never any doubt that New Directions were going to win. And far too much Kurt - really don't like his voice. I did love the Wicked poster in the judges room though. And Loretta Devine! On a non-episode related note, why is Terri still listed as "Starring"? Seriously? She's been in what, two episodes? Also Mike Chang is only a guest star? Love the original songs, "Hell to the No" was good, "Get it Right" was amazing (thanks Lea! )! "Loser Like Me" reminded me a bit of High School Musical but it was also amazing! So, New Directions will compete against Vocal Adrenaline at Nationals, right? Notice wrote: So, New Directions will compete against Vocal Adrenaline at Nationals, right? Yup. With Sunshine Corazon at the helm! Joshua wrote: Much like most of Season 2, this episode was just "Ok". Nothing special, tbh. I liked the amount of songs for this episode, but seriously, more Rachel-Finn-Quinn love triangle crap? The thing that irked me (and I did enjoy the episode) is I wanted to feel a rush when they won...I didn't. It just seemed like, oh, well, that's not surprising. Maybe that's intended to create this "we rock" attitude before a reality check at Nationals, but...as a viewer, I wanted to really love the moment. Exactly; I just didn't feel the joy in New Directions winning. It was like "Meh, saw that coming." The whole episode as a whole was predictable and hardly enjoyable. It had its moments, but for the most part, it just continued the recent downward spiral. - Apparently, too much Kurt is a bad thing. - We need more Sue and Mercedes. - I still don't like Sam. - The Gleeks aren't too good at writing their own songs, save for the two at Regionals. - Sue and her team needed a bit of development. - Guest stars continue the trend of being annoying. - The Warblers are too good. Agreed, SLJ, I'd really like to see more Sue and Mercedes hasn't had a storyline this season at all. Specifically, the two of them together. The two always make some good humor. I'd appreciate an episode where they're forced to work together again. SLJCOAAATR wrote: Specifically, the two of them together. The two always make some good humor. I'd appreciate an episode where they're forced to work together again. Should there not have been 4 groups competing, seeing as both New Directions and The Warblers came from one sectionals? It wouldn't have just been New Directions vs. Aural Intensity I assume. Fair enough, I did love the stick throwing moment. I did find Sue punching the woman in the face at the end to kind of come out of nowhere and then it just seemed to be ignored (and likely forgotten by the time the show returns).